Poinsettias are the Pound Puppies of the plant world; lovely gifts for Christmas, but by February, they’ve lost their charm and most of their leaves and are bound for the compost. But wait! Can they be rescued? Possibly, but it’s a bit more difficult here in Melbourne. Driving through northern NSW and up to Brisbane, they flower freely in the gardens. Our Melbourne climate is colder, but these beautiful plants are worth the effort. When your Christmas gift is drooping and losing its leaves, it’s time to cut it back and re-pot. Always use fresh potting mix. If you are going to try your luck and plant it outside, then choose a North-facing wall to protect and shelter it. Plant it into a mound of potting mix, so that it is well drained. They will die with wet feet. To meet with success, your Poinsettia needs sun, shade, shelter, feed, pruning and luck! Ideally, plant it into a pot so that it can be moved as the seasons change; then bring it out as it ‘flowers’. 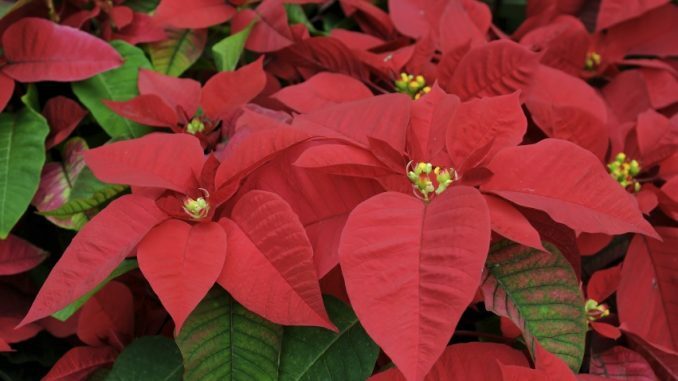 Poinsettias are Euphorbias – which translates as ‘Rubbish flowers but pretty leaves’ (bracts). As the plant grows, the bracts turn green and become leaves. Most popularly seen in red, they are also available in orange, pink, cream and variegated mixes of the above. These will grow into a striking bush which flowers for months, so here is a New Year’s resolution for you: save your poinsettia. Suzsi Mandeville describes her gardening addiction as one of her three vices – along with writing and white wine! Suzsi has written two historical adventure novels, available on Amazon.com.